Banks aren’t what they used to be — the days of stuffy vaults and high counters are long behind us. Banks of the modern age need a modern way to interact with customers, and customer relationship management CRM software (customer relationship management) offers just that. But which CRM software do banks use? To answer, our analyst team has compiled this list of the top CRM for banks to help you stay informed. Why Would Banks Use CRM Software? I know what you’re thinking — isn’t CRM a sales thing? My business is a bank! Well, yes and no. CRM is much more than just a helpdesk system for processing customer service tickets, although it does that too! CRM transcends industry: if you have customers you interact with, CRM can be beneficial to you. CRM in banking helps you track information about your clients to better serve them. Did you know 59 percent of customers report that personalized interactions were very important to keeping their business? Customers of financial services are no different — they want to feel like their bank cares about them and can cater to their specific needs. This starts from the first point of contact and continues through every interaction throughout their financial journey. There are managerial perks as well — CRM systems streamline disparate workflows like agent calendars, customer service tickets, product up-selling, etc., and combines them into a single intuitive interface. From self-service portals where customers can manage their accounts to analytics systems that suggest the next-best-action to representatives, CRM aims to make your life easier and more organized. Hopefully, you’re warming up to the idea of why CRM can be useful to financial institutions — but how do you go about choosing one? That’s a hard question to answer, unfortunately. While I’d love to just tell you which CRM software was objectively the best, there is no such software. Your individual needs dictate the requirements you should seek from a software system, and every product specializes in different areas. Finding the product that performs best in the features you’ll use the most is one of the best ways to go about choosing a software system for your bank. As one of the biggest names in software, it’s no surprise Salesforce has a module for financial institutions. Salesforce offers an industry-specific CRM called “Financial Services Cloud” that is built with banking and financial institutions in mind. This vendor’s bank CRM software includes built-in integration with MuleSoft AnyPoint, which provides a 360-degree view of your customers. Integrated customer portals let users provide data about their financial needs in a secured environment to help agents resolve tickets efficiently. The online case management feature lets users edit and access service cases anywhere — even on their mobile device. Those cases can be easily escalated to subject matter experts if needed so customers can get accurate answers to questions quickly. 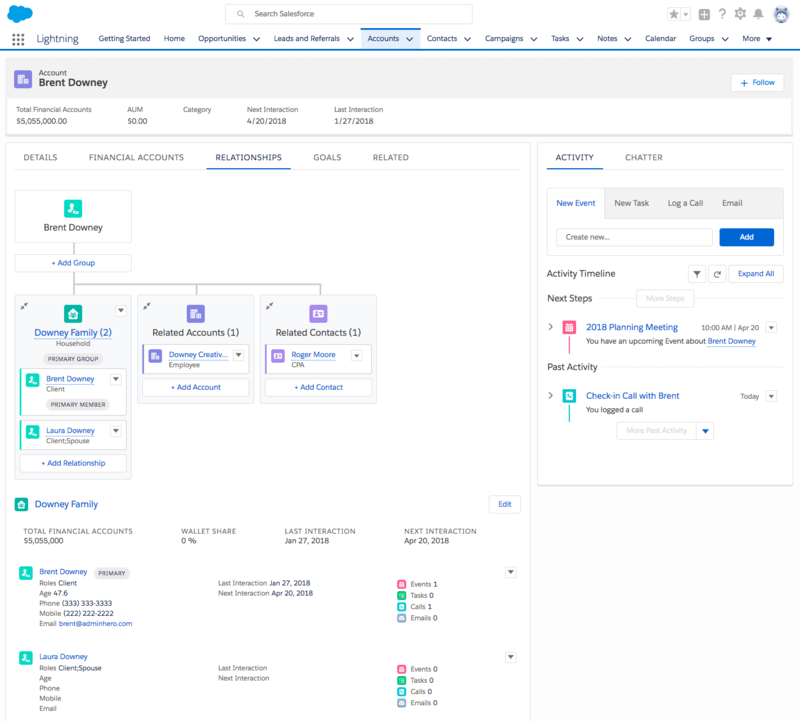 Salesforce Financial Services Cloud also helps users streamline slow-moving loan cycles and lending processes to enhance borrowers’ experience. Unifying your business experience into a single platform offers all users (including customer service agents, lenders, borrowers, real estate agents, dealers and brokers) self-service options for their convenience. A crucial benefit of CRM banking software is its customer engagement hub. This improves the user experience via multiple channels by making it more convenient for them to interact with your institution. Salesforce Financial Services Cloud lets banks create personalized journeys for individual customers to make their experience personal and seamless. 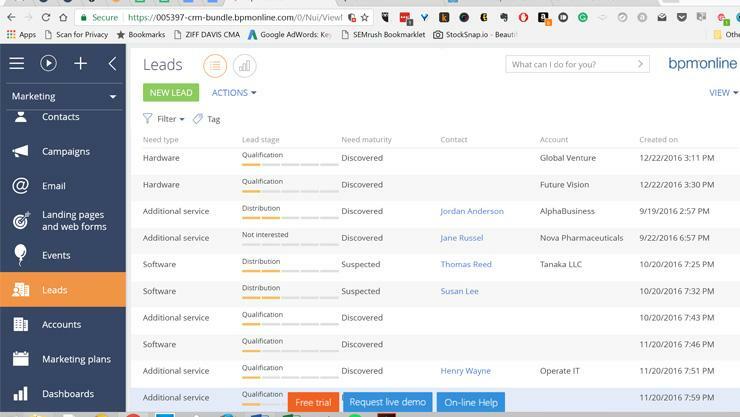 The Lead and Referral feature for retail banks funnels leads to the appropriate advisor, agent or manager to solve their issue. Its centrally managed system captures and prioritizes (or segments) leads from a range of contact points, then directs them to the correct specialist. This prevents information from being lost in transferal and improves the customer experience with your customer care. 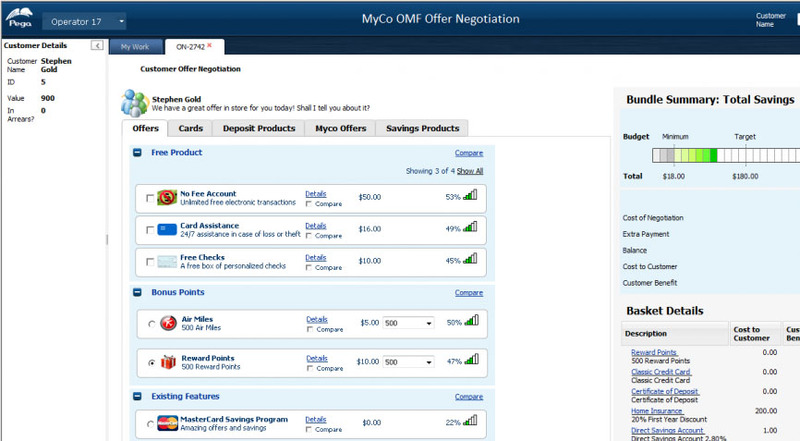 Bpm’online offers CRM software banking enterprises will love. It supports the full bank management cycle, from business development planning to multi-level operational management. Users can track execution stages and the managing parties for each step of individual projects and processes. Retail banks can maximize their cross-selling and up-selling opportunities by utilizing the suggested next step feature from this CRM. Agents can evaluate customer satisfaction and manage customer interactions closely, quickly and efficiently through the intuitive customer care portal. This CRM goes beyond customer contact points. Bank representatives can use bpm’online to plan work, schedule meetings and organize tasks. Managers can create individual or group tasks and link them to contacts, document and opportunities to streamline workflows. These tasks can also be synchronized to Microsoft Exchange or Google Calendar. Bpm’online offers customizable templates to set up lending processes, define document sets required for loans, create lending terms and more. Special forms record detailed information about the borrower including contact points, co-borrower(s), etc. that can be easily transferred throughout the system. Some additional capabilities that make this CRM software for investment banking and other financial services appealing are its collaboration tools, lead management, account management, sales forecasting, product management, knowledge management, opportunity management and analytics. SugarCRM is based on open technologies, so it offers high flexibility and customization capabilities to financial institutions. It can be deployed both on-premise or in the cloud and offers integrations with a range of middle- and back-office software platforms like risk management, business insight, know your client (KYC) and master data management (MDM) systems. It secures all customer data, so you’ll never have to worry about meeting regulatory compliance expectations. With SugarCRM, all customer-facing employees have the tools to engage effectively with clients on a range of devices. Departmental silos can be broken down via embedded collaboration tools, which also help to increase service and engagement levels. By drawing from external and internal data sources, SugarCRM provides contextual intelligence and data-driven analytics. These are presented on a single intuitive dashboard that is easy to use for all levels of user. SugarCRM’s email utilities allow users to create visually appealing email marketing campaigns to stay connected with customers. No design skills necessary — this platform offers templates to make it easy for users of all skill levels to craft engaging email marketing materials. Does your bank use international outreach programs? If so, SugarCRM has your back: it comes in 26 different languages and has support hubs in Europe, the Americas and the Asia Pacific region. SugarCRM also supports initiatives to streamline sales, marketing and service. It offers multi-step marketing campaigns from planning through implementation. In addition, SugarCRM helps banks analyze customer behavior data to identify customers contemplating switching providers in order to react effectively. Pega CRM is among the best CRM software for banks because of its analytics engine. It processes both unstructured and structured data to determine a next-best-step action in each customer interaction. This marketing solution utilizes predictive analytics to know how to guide your agents to up-sell and cross-sell effectively. This marketing platform lets users edit their CRM interface, rules and processes with basic coding, so you never have to wait for a support ticket to get the job done. Pega automatically generates the code you need to alter modules and rules to make your CRM exactly how you want it. This makes it an ideal investment banking CRM — users can quickly adapt to market changes and opportunities and pass those adjustments on to their customers. Pega’s Better Business Software helps retail bank agents reduce the cost and time of onboarding new clients. It streamlines automated sales processes, as well as lets users create and monitor multi-channel campaigns in order to offer the right product or service to individual customers at the ideal time. Pega CRM’s sales force automation platform automates the sales cycle from opportunity to return customer. Its contact management features organize potential leads and opportunities so users can easily navigate to specific clients in the system. Intuitive dashboards offer an overhead view of individual accounts and case management features let users handle complex sales processes with ease. Pega Client Service for Capital Markets offers multi-channel services with guided desktops for service managers and workflow automation for client inquiries. Its web self-service portal lets clients address their own questions and service requests before seeking further assistance from a representative. Pega helps banks deliver excellent customer-focused service through various channels. Relationship managers can focus on clients instead of mundane data-entry and other repetitive administrative tasks. Dynamics 365 offers a powerful CRM product to consolidate data silos from branches, advisors and back systems to create a unified customer view. This profile includes account history, profitability of the customer, interaction history, behavior and banking preferences to help bank reps offer a personalized banking experience. Microsoft Dynamics CRM for banks also helps users improve their cross-sell conversion rates by targeting the right time to offer additional products or promotions. Furthermore, they can shrink sales cycles as well as improve sales their sales forecast accuracy by utilizing automated workflows and repeatable sales processes. Users of Dynamics 365 can analyze and segment customer data to categorize them in their financial journey. This CRM integrates key business systems to help identify high-risk customer behaviors like poor credit score, late payments and other potential problems. This helps meet regulatory requirements, increase profitability and intelligently manage risks. The role-based permissions aspect of Dynamics CRM helps keep customer data secure. With automated cross-department collaboration, follow-ups and escalations, Microsoft Dynamics streamlines the customer service experience for both sides of the interaction. CRM software in banking can drastically improve your customer interactions and experience. In the modern age, consumers expect to be catered to and taken care of. CRM helps make that goal a reality, helping you take your customer relationships to a whole new level. To find out which of these products (or one of many others!) best fits your business, check out our interactive requirements template. And don’t forget to compare vendors based on their features with this comprehensive CRM comparison matrix. Make your life easier, more organized and more efficient by finding the right CRM for your bank or financial institution today. Still have questions about what CRM can do for you? Ask them in the comments!